GeoCue Group has released a GNSS positioning system that will allow users of DJI Phantom 4 Pros and Inspire 2 drones, as well as most drones using higher end cameras, to achieve survey-level accuracy with minimum ground control. Positioning Accuracy. 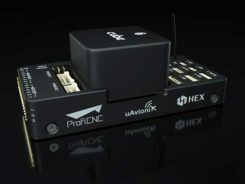 Loki uses the new AsteRx-m2 multi-frequency, multi-constellation GNSS engine from Septentrio, which has 448 hardware channels. GeoCue’s Loki positioning kit uses the Septentrio AsteRx-m2 GNSS engine. 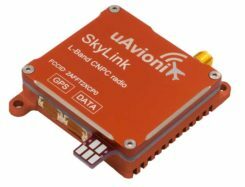 Loki is a self-contained kit that provides all of the hardware and software needed to equip a drone with a post-processed kinematic (PPK) multifrequency, multi-constellation, differential, carrier-phase GNSS. Using a local base station (not included), Loki provides centimeter-level positioning with minimal, and in some cases, no ground-control points (though GCPs are always recommended for quality assurance). DroneDeploy of San Francisco has become a leader in cloud-based processing for DJI, as well as other drones. DroneDeploy has enabled users of Phantom and Inspire drones to easily upload drone images, work online with analytics, and download point clouds and orthophotos to desktops for advanced processing. Without Loki, achieving acceptable network accuracy requires the time-consuming placement of ground-control targets throughout the mapping site. GeoCue and DroneDeploy have been working together to ensure a smooth Loki-DroneDeploy workflow from field to finish. Loki requires a local multifrequency base station (not included but available from GeoCue). Loki is shipping to early adopter customers in August 2017. It will be available for the general market in September 2017. It will release with direct support for DroneDeploy and AirGon’s Bring Your Own Drone (BYOD) Mapping Kit. Loki’s introductory price will be USD $4,995. GeoCue is currently accepting preorders.